The Steam Paradox sale just ended yesterday and after five days of productivity-shattering deals I found myself owning the base collection of Crusader Kings 2, plus the majority of DLCs. Never have I thought that a grand strategy game could grip me in front of my PC with my eyes peeled open. 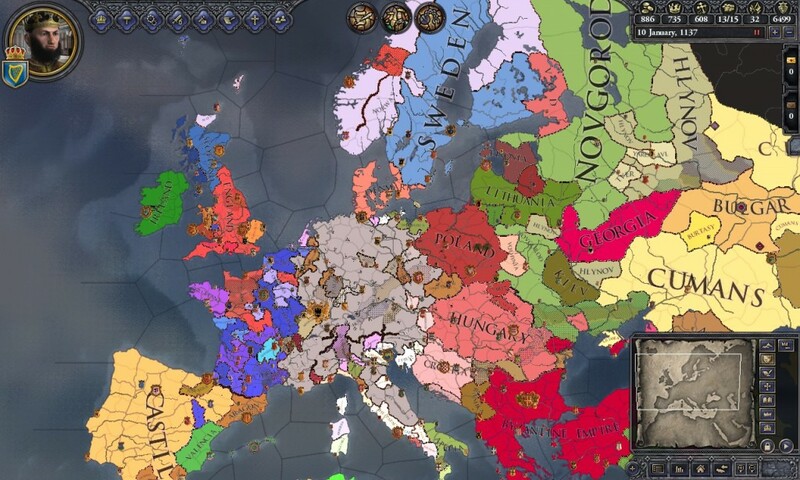 As I’m writing this I’m itching to get back into CK2, wanting to delve deeper into the chaotic Europe of 769 – the game usually starts almost 300 years later, but owning the Charlemagne DLC extends game time. There are a ton of holy wars to take part in the medieval world of Crusader Kings 2, but the depth of political intrigue and the engrossing power struggles make CK2 a superb immersive experience that every strategy enthusiast should play. Paying attention if your King likes you enough to help on the long run and keeping your vassals happy and unwillingly to form an independent faction barely scratches the surface. Whether you are throwing parties to build a relationship with a foreign ally or maintain one with someone that has ties to the High Chiefdom of Pomerania, Crusader Kings 2 will relentlessly try to ruin your plans. 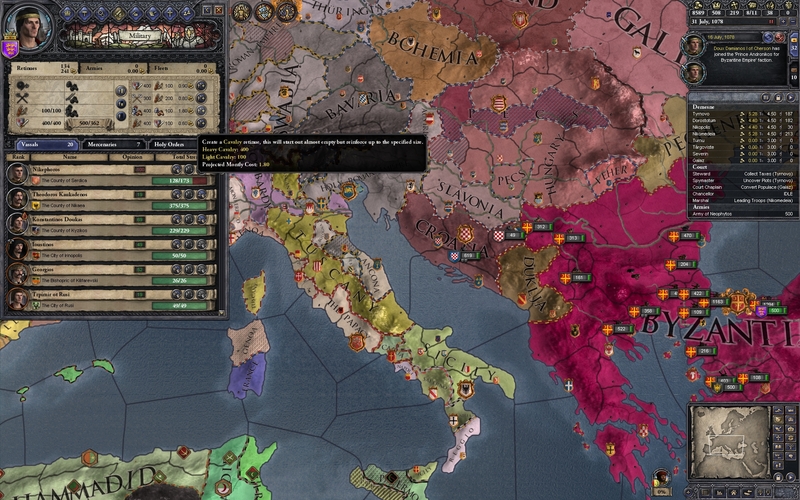 It’s complex, and CK2 isn’t for the faint-hearted, but if you stick with it and it’s overwhelming learning curve, it will shower you with rewards that bold deep into the human element of power – more exactly, power trips and the likes. You don’t have a set objective. You start as either a high chief or a vassal, but this doesn’t really mean anything as alliances are crumpled in mere seconds just because, let’s say, Lesser Poland absorbed Greater Poland and now has its eyes set on Curonia and Pomerania. You will lose – a lot. Yet, losing is part of the game and the history of mankind. The only rule is to have an heir to the throne so that heir can continue for another fifty years or so proclaiming that your dynasty will eventually usurp all of Europe. But beware, if you don’t have an heir the game will end.That’s the only tangible goal within Crusader Kings 2 – have a son to continue your bloodline. Have a daughter, and well, it’s way tougher than you think to keep on playing. But that’s for you find out yourself. The way you manage your vassals is a crucial aspect of the game because it focuses on how personal relationships affect even those who rule with an iron fist. Every character in CK2 has his own opinion of you. It’s displayed as a single number from 0 to 100 – you are put on a pedestal and worshipped as either a beloved friend or a highly respected individual; and from 0 to -100, which means that someone hates you with a passion. Opinions are indicators on how well you can rule over vassals and if your liege will help in a dispute or throw you in the dungeon to rot. Like in real life, opinions change if you do something . Break a peace treaty with someone? Well, don’t expect people to trust you for some time. Execute one of your prisoners? There are some nasty consequences that involves the church. Failing to follow-up on a call to war? Your prestige will suffer immensely. You need your constituents to respect you if you plan on usurping lands and building a Kingdom. But some factors are clearly not controllable, such as maladies that you were born with. These are lifetime social stigmas that will pose as huge obstacles. Born with a stutter will affect your diplomacy, and being the love child of a brother and sister will lead to a lack of a good general opinion. Inbreeding is highly frowned upon. Vassals and bishops, counts, dukes and what have you, will supply their liege, as in you, with tax income and troops if their opinion is high enough. Everybody has his own agenda and this makes a tedious back and forth between you and your minions. If you keep them in constant wars, then they’ll start to see you as a blood-seeking warmonger and they’ll nurture a bitter hatred for you. If you send your child to be educated by one of your underlings, then you’ll grow in their eyes. These relationships make sense and that’s how the real world tends to work like. The game will end in 1453 and it will tally the prestige score of every rule your have played with until then – that is, if you’re lucky enough. You have to keep an eye out who you are marrying and what her social status is. 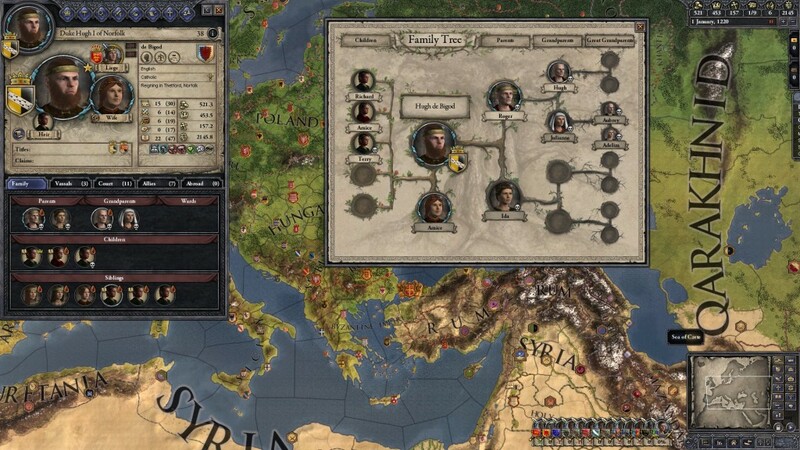 Marry a religious nut or a homosexual and the chances of you having a son heir to the throne decrease faster than you can spell – T R O U B L E. Yet, even though you are staring at a static portrait of a character placed on a menu filled with a bunch of personality traits and statistics, you end up falling in love with your dynasty. You can give them names and form the bloodline to rule Europe as you see fit. When your son comes of age you give him his own land and he’ll immediately start to form his own alliances and wage wars on nearby dukes. This offers a genuine sense of attachment that you rarely get from a video game. 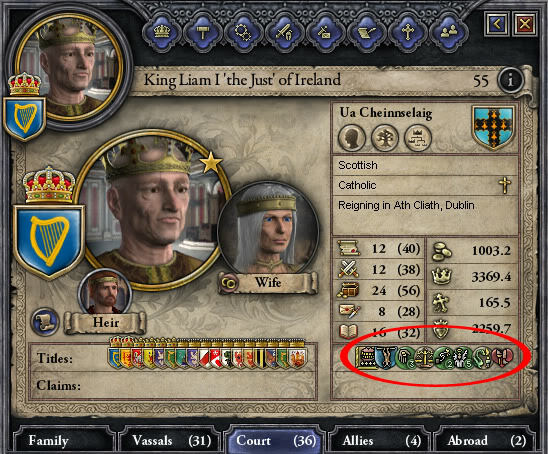 If you neglect your family members, if you prove to be a tyrant with them as you are with your duchy, then expect them to resent you as much as your nemesis. This could actually lead to a grand civil war if they have the troops to contest your reign. Some will take to plotting against you ending with their beloved liege dead because he ate a poisoned piglet.The Crusader Kings 2 A.I. is really smart and it governs characters with a stern and reliable hand. The A.I. is rarely frustrating. The only time I thought game bugs where in place was when I didn’t take a look at the personal trait of the character in cause – those who have the insane personality trait usually bear an illogical and chaotic behaviour. While CK2 rewards players that build their dynasties without going on a killing spree and adopting a more pacifist play-style, overtaking territories and expanding the boundaries of your empire is more satisfying – this also means more goodies for your to grasp. Building a strong army is important, but not the most important element. Combining diplomacy with intrigue and a powerful military is a wiser method. A huge army may very well be one of the most important ingredients in your Chaos Soup, but on the long run, your vassals’ respect will dwindle with time and you’ll end up harbouring a handful of well trained footsoldiers. Using your council to sow dissent and construct spy networks in the enemy territory is one of the most fun aspects of the game – and one of the most crucial ones too. You need a casus belli in order to attack a character. This means a reason for declaring war on the unfortunate soul. You get a casus belli through fabricating a claim on their land and collecting nearby territories. Yet, sending your spymaster, who is one of the five specialist members within your council, and ordering him to fabricate a claim on a land proves to be more successful than just sitting nicely on your throne waiting for others to attack you. He does so through threats and bribery, scheming his liege’s way into a conflict. You’ll most likely resemble a cartoon villain stroking the fur of his white cat and laughing maniacally as his plan unfolds. Declaring war and ensuring that you have what it takes to usurp your rival’s land is easier said than done. Mainly because if you don’t pay attention to what allies he has, you’ll end up going home with your tail wagging between your legs. Furthermore, building and ensuring the strength of your army in Crusader Kings 2 is an expensive task. You need a lot of money to resist in a long conflict. Your troops will butcher your income – one month at a time. This means that you need to construct various structures in your holdings to alleviate the stress of war – markets, trade posts, castles and such. Raising taxes on churches and on your noblemen is a means to get what you want, but don’t make them skyrocket or dissent will set in. Clever players can take to CK2’s game mechanics to make war lighter on their treasuries. Call in allies and vassals to help you with their troops, use your chancellor, which is another specialist council member, to spread rumours and dissent in your enemy’s territories so he has less troops available and far less tax income. Unfortunately, everything you learn will be through trial by fire. 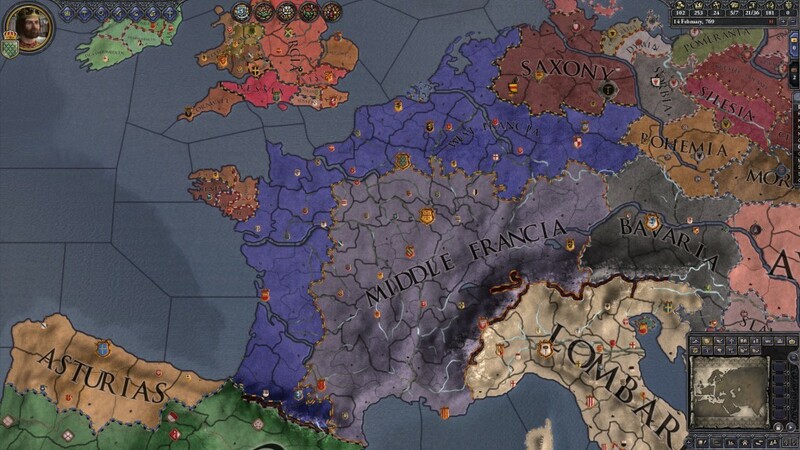 Crusader Kings 2 is like that crazy uncle that throws his 5-year old niece into the ocean just so she can learn how to swim. Tutorials are a good starting point, but I would rather recommend you just sink your teeth deep into a scenario or a custom game and fake it until you make it. Take a look down below for Crusader Kings 2 Mods, Crusader Kings 2 Traits and Crusader Kings 2 Cheats. The majority of mods are completely free, but you install them on your own risk. While there are curated lists, malware can be present without anyone knowing. We aren’t to be held responsible for any damages brought to your system. With that being said, there are a few mods that any Crusader Kings 2 fans must play. 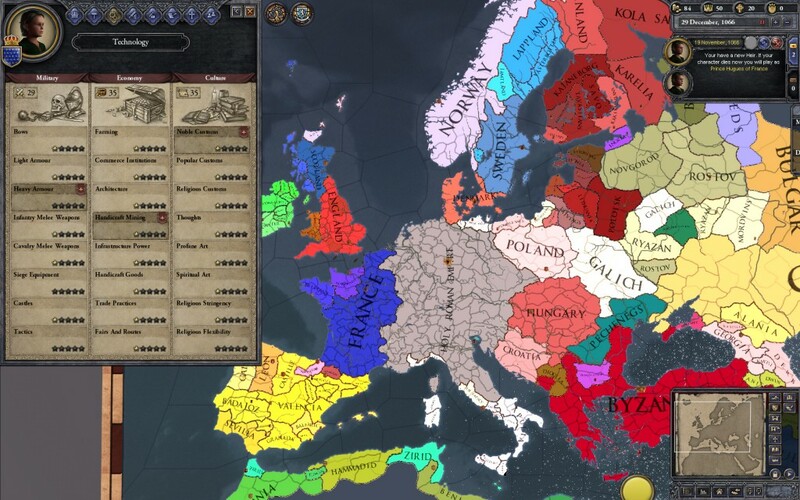 Take the Crusader Kings 2 Game of Thrones mod. It tells George R.R. Martin’s story of a Song of Ice and Fire, where lords from Westeros and the Seven Kingdoms in the west battle each other for the Iron Throne. The worldwide sensation Game of Thrones can be finally played, but please take it with a grain of salt. While it is indeed really fun, it’s not on George Martin’s writing level. 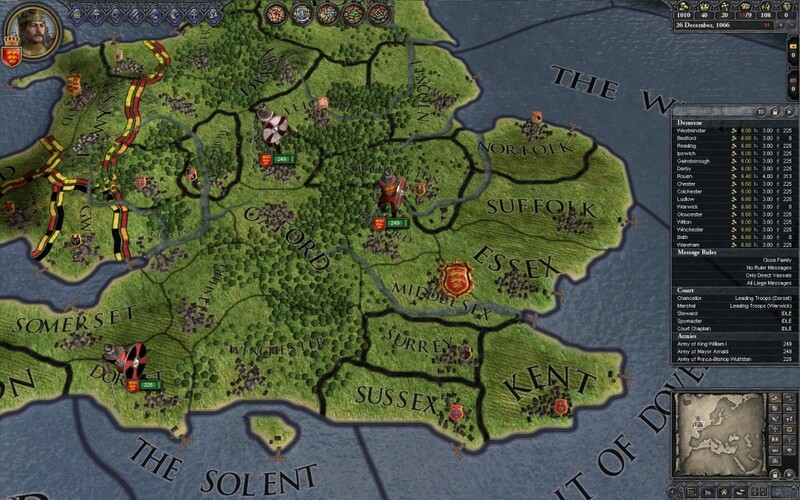 You can download the Crusader Kings 2 Game of Thrones mod right here. There’s even a Crusader Kings 2 mod that showcases a world that resembles Len Wiseman’s Underworld – a realm filled with vampires, werewolves and all the creatures of the night. It can be found in the Steam Workshop. 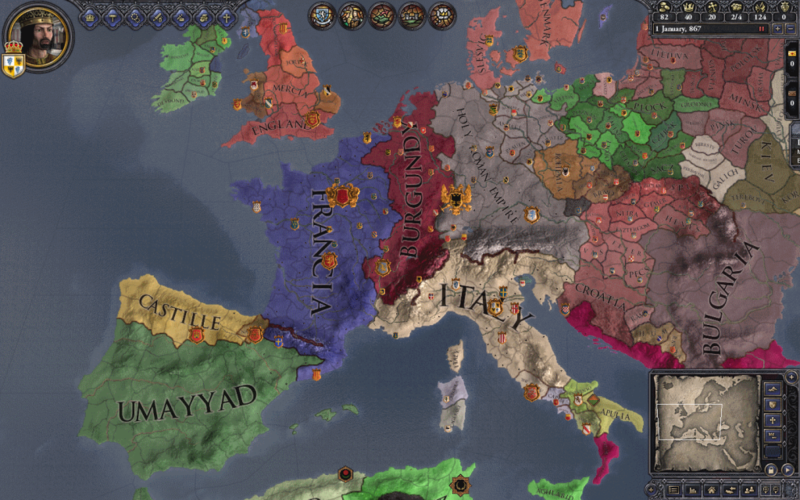 It’s called CK2 Mod Mythos – Vampires, Werewolfs and Much More. One of the best CK2 mods I have ever played is the one that brings CD Projekt Red and Andrzej Sapkowski’s The Witcher Saga to the Crusader Kings 2 medium. It can be found in the Crusader Kings 2 Steam Workshop page under the name The Witcher Kings. Traits are your character’s abilities, and personal characteristics. They are physical or mental stats. Traits can be gained or lost during education events. There are educational traits, health traits, congenital which splits into bad and good traits, lifestyle traits, personality which splits into the seven heavenly virtues and the seven deadly sins with some other uncategorised traits, leadership traits, religion and special traits. There are too many Crusader Kings 2 traits to list here. If you plan on reading them all, take a look at the official Crusader Kings 2 Wiki. What I can do is showcase the most important ones. It’s a given that when you customize your character you shouldn’t add any bad congenital trait. Also, the seven deadly sins aren’t as deadly as you may think. Take Proud, it actually gives more than it takes – you get 0.5 Prestige per month. Of course, there are some deadly sins that you should definitely stay away from, such as Slothful, which takes away one from each of your characteristics i.e. diplomacy, martial, stewardship, intrigue and learning. Genius is a must trait, which gives +5 to every characteristic and it has a 15% chance of inheritance. Meaning that your son may turn out to be a genius also. Of course, stay away from Health related traits – they take more than what they offer, which is nothing. If you get the Incapable trait you can consider yourself as good as dead. Brilliant Strategist is a pretty great choice if you plan on going all murdery on unknowing neighbours. It offers +9 to your martial characteristic +2 to stewardship and intrigue, but takes away one from learning. It also gives +0.5 more health. The Crusader Kings 2 Way of Life DLC allows the possibility to customize your character at the beginning of your dynasty. It’s best if you buy it and the Charlemagne DLC. Usually I’m against cheat codes, but with a game like Crusader Kings 2, you just have to get some external help from time to time. To bring up the console where you can type your cheats, just press the ~ symbol. Cash will give you 5,000 gold pieces. Piety will give you 5,000 piety. Prestige will give you 5,000 prestige points. Age <char-id> +/-(#) will result in adding or subtracting a character’s age. Add_learning <char-id> +/- will result in adding or subtracting a character’s learning. Add_martial <char-id> +/- will result in adding or subtracting a character’s martial. Add_intrigue <char-id> +/- will result in adding or subtracting a character’s intrigue. Add_stewardship <char-id> +/- will result in adding or subtracting a character’s stewardship. Add_diplomacy <char-id> +/- will result in adding or subtracting a character’s diplomacy. Fow will either enable or disable the fog of war. Claim <title> <char-id> will result in giving the selected character a claim on the selected title. 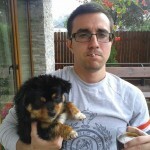 Give_title <title> <char-id> will result in giving the selected character the desired title. Pollinate female char-id male char-id will result in impregnating a female character by the chosen male character. Kill (char-id) will result in killing the character who has the specified ID. Marry_anyone will result in the ability to marry anyone, including your family members. Allow_laws will result in automatically approving any law you give without having to vote or wait. Discover_plots will result in discovering any plots that are currently in progress. Imprison <char-id>(prisoner) <char-id)(jailer) will result in putting the prisoner in the selected jailer’s dungeon. Event 1711 will remove the arbitrary trait. Event 38283 will remove illness.